Spring 2019 will see this award-winning healthy fast-food chain open two new venues in Dundrum and the city centre. 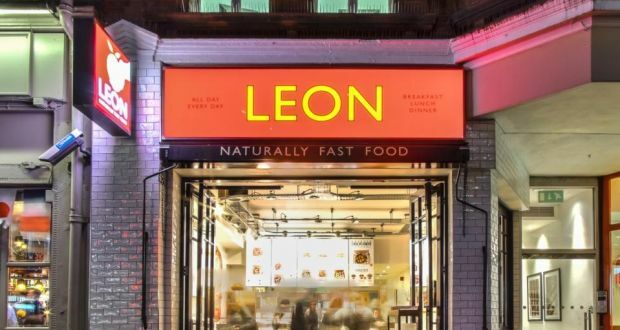 Rumours of an exciting new opening have been swirling around the city, and at long last they have been proven to be true: Leon, the award-winning healthy “naturally fast-food” chain, has officially announced that it is coming to Dublin. Having produced best-selling cookbooks and a range of Leon merchandise, the UK-based chain is now on a mission to go global. With over 60 stores, including in Amsterdam, Norway and Washington DC, the Dublin opening is the next step on its journey. The franchise has promised to open its doors in Dundrum Town Centre in spring 2019, as well as in a city-centre location. Leon also has plans to open 20 new restaurants nationwide by 2023. Leon restaurants turn the concept of “fast food” on its head. Formatted like McDonalds, at a glance, it seems that it has much the same offerings as the notoriously unhealthy, greasy joint. Don’t be fooled – Leon’s founders are much more concerned about your health. While it does offer burgers, chicken nuggets and sundaes, they are vegan beetroot burgers, gluten-free golden 100 per cent British chicken nuggets, and live-yoghurt sundaes with berry compote, topped with dark chocolate granola. According to one of Leon’s founders: “You feel good when you eat it, and it’s kind to the planet.” And reportedly, everything is delicious. Leon’s food follows the principles of the Mediterranean diet, which is now known as one of the healthiest out there. This means that the menus feature a lot of plants, good fats, herbs and healthier, leaner meats. Its cakes also echo this cultural influence, with raspberry and blueberry pasta de natas, as well as remakes of the American Dream classics: chocolate chai baked donuts and “better brownies”. Leon has been awarded a three-star sustainability rating by the Sustainable Restaurants Association, using exclusively renewable energy and promoting the saving of rainforests through its coffee sales. Having been dubbed “the future” by the Times, it’s heartening to see that Leon is pioneering what will be a new wave of conscious restauranteering and affordable healthy options.